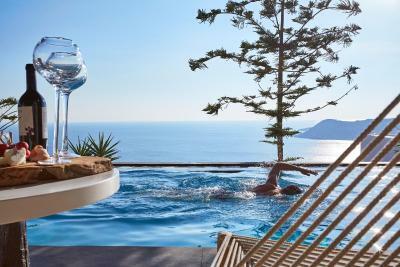 Lock in a great price for Myconian Utopia Relais & Chateaux – rated 8.9 by recent guests! 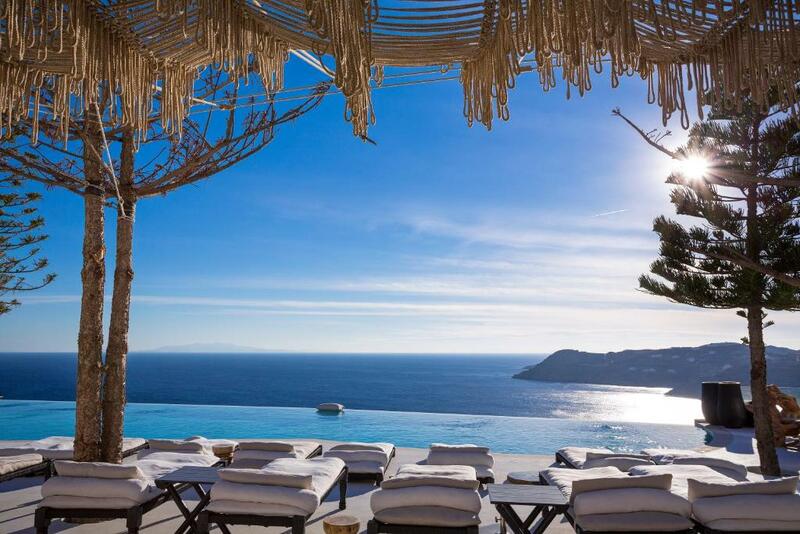 One of the best hotels we ever stay, great mykonos experience! The stuff was very helpful and kind. Good breakfast, the pool area is breathtaking. Very recommend! The shuttles to and from the beach were never more than a minute or two wait. Very accommodating. Wow, this is such a beautiful hotel! THIS HOTEL IS EVEN MORE BEAUTIFUL in person than it is on the photos! Everything was spectacular, from staff to food, wow! Just wow! We are going back for sure! I really enjoyed everything about this resort! The staff was super attentive to your every need. 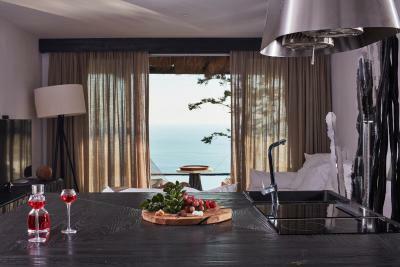 The views and the design of the resort are exceptional. The food and drinks at the bar were also amazing. Amazing service, complimentary breakfast had the widest and best choice of items, not to mention gluten and sugar free options. We ate several lunches and dinners there and they don't disappoint. Accommodations are spacious and well appointed. I have already written a review previously, giving huge accolades to the staff and location of this hotel. Five stars all the way. Again, Jenny, Julian, Kostas and Christóforos (Royal Myconian) were all stand-out staff who made us feel very welcome and well taken care of. Gosh, where to begin? This hotel is exquisite. 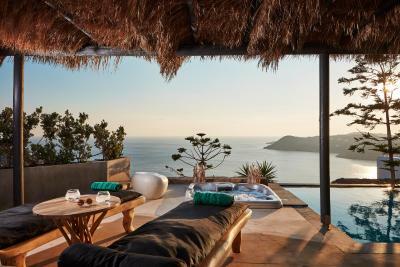 Myconian Utopia sits at the very top of the The Myconian Collection. The photos provided are accurate, but do not do justice to its beauty. We were absolutely blown away by this hotel. 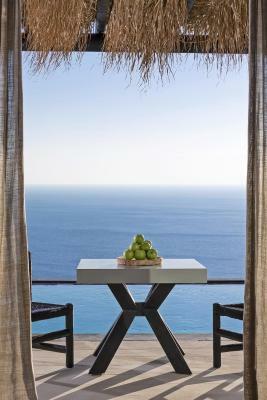 Beyond the beauty of the property itself, the staff are impeccable. While everyone there went out of their way to be accommodating and helpful, honorable mentions to, Jenny, Julian, Kostas and at Royal Myconian, Christóforos; they all made our stay unforgettable. The daily buffet breakfast is one that I have not seen the like of before; it has pretty much anything you can imagine for breakfast, and the food is replenished up until the end at 10:30. Each day our room was made up to look they way it did when we first checked-in. We are looking forward to our return stay in 2019. 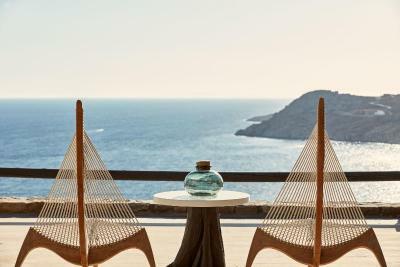 Myconian Utopia Relais & Chateaux This rating is a reflection of how the property compares to the industry standard when it comes to price, facilities and services available. It's based on a self-evaluation by the property. Use this rating to help choose your stay! 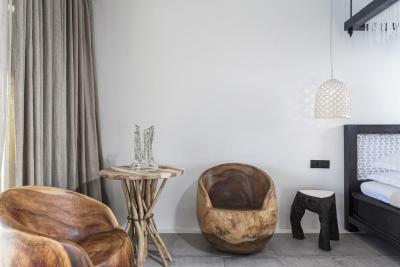 One of our best sellers in Elia Beach! 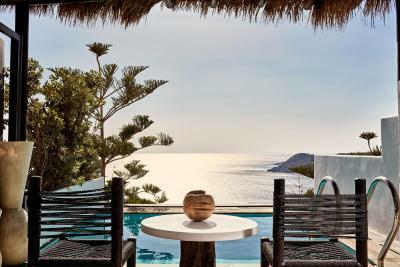 Offering an outdoor pool and a restaurant, the traditionally built Myconian Utopia Relais & Chateaux is located on a hill, just 350 feet from Elia Beach. 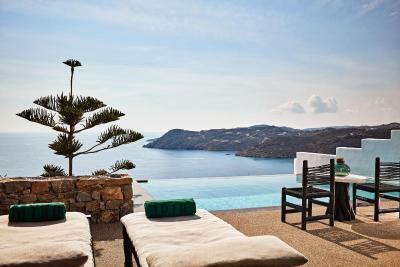 It features tastefully decorated accommodations with Aegean Sea views and free WiFi. 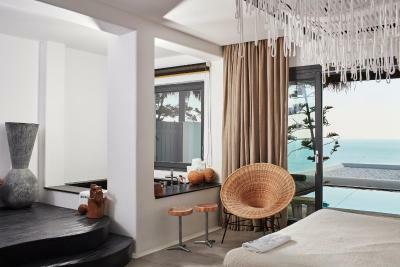 All air-conditioned rooms and villas of Myconian Utopia Relais & Chateaux open to a furnished balcony and have a mini fridge and a flat-screen, satellite TV. 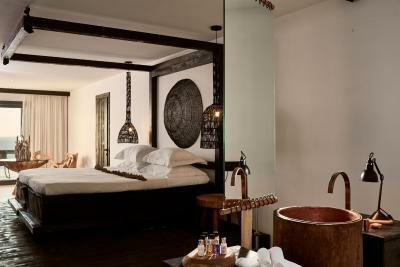 Featuring a rain shower, private bathroom also comes with a hairdryer. 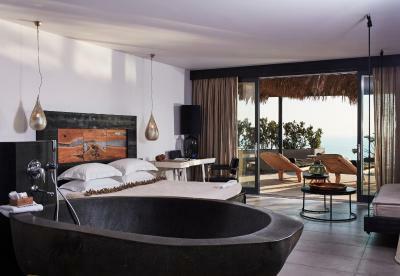 Some units are fitted with a hot tub or a private pool. 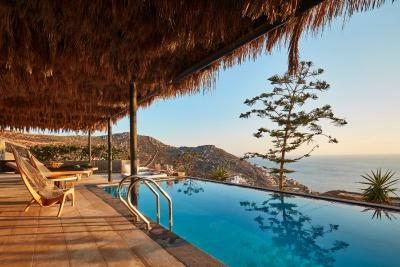 Guests may relax on the sun loungers of the sun terrace by the pool or keep fit at the on-site fitness center. 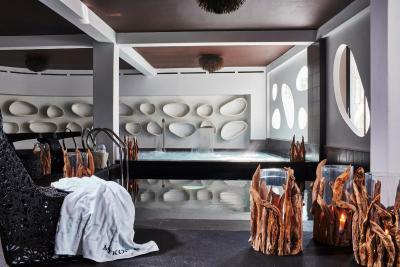 Several massage treatments can be provided at the spa center upon charge. 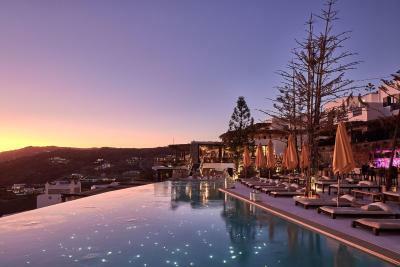 This resort is 7.5 mi from Mykonos Airport, while the scenic town of Mykonos is also 7.5 mi away. Platys Gialos Beach is at 6.2 mi and the beach of Psarrou is 8.7 mi away. Free private parking is possible on site. 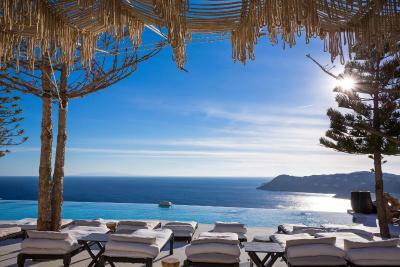 When would you like to stay at Myconian Utopia Relais & Chateaux? 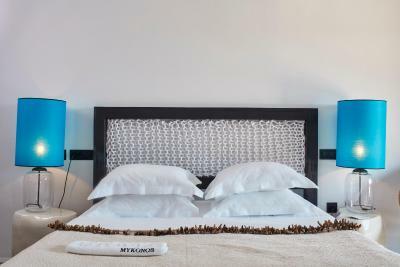 Opening to a furnished balcony with Aegean Sea views, this air-conditioned and tastefully decorated room has a mini fridge and a flat-screen, satellite TV. Featuring a rain shower, private bathroom also comes with a hairdryer. Free WiFi is provided. 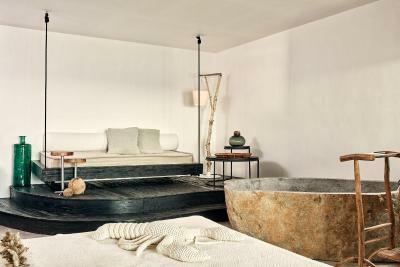 Offering a private pool, this air-conditioned and tastefully decorated room opens to a furnished balcony with Aegean Sea views. It has a mini fridge and a flat-screen, satellite TV. Featuring a rain shower, private bathroom also comes with a hairdryer. Free WiFi is provided. 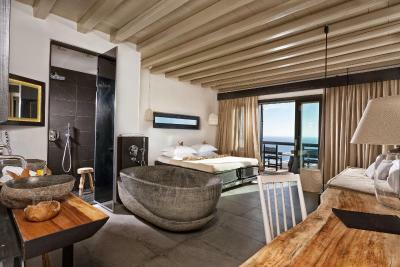 Opening to a furnished balcony with Aegean Sea views, this air-conditioned and tastefully decorated room is more spacious. It has a mini fridge and a flat-screen, satellite TV. Featuring a rain shower, private bathroom also comes with a hairdryer. Free WiFi is provided. Offering a hot tub, this air-conditioned and tastefully decorated room opens to a furnished balcony with Aegean Sea views. It has a mini fridge and a flat-screen, satellite TV. Featuring a rain shower, private bathroom also comes with a hairdryer. Free WiFi is provided. 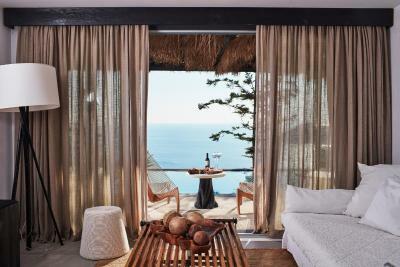 Opening to a furnished balcony with Aegean Sea views, this air-conditioned and tastefully decorated room is very spacious. It has a mini fridge and a flat-screen, satellite TV. Featuring a rain shower, private bathroom also comes with a hairdryer. Free WiFi is provided. 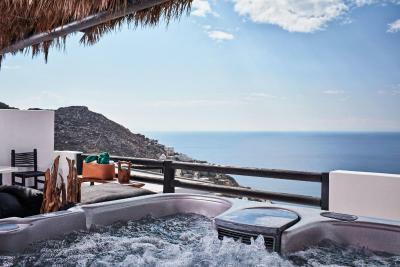 Offering a hot tub, this air-conditioned and tastefully decorated room is very spacious and opens to a furnished balcony with Aegean Sea views. It has a mini fridge and a flat-screen, satellite TV. Featuring a rain shower, private bathroom also comes with a hairdryer. Free WiFi is provided. 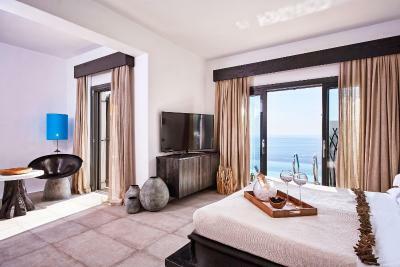 Offering a private pool, this air-conditioned and tastefully decorated room is very spacious and opens to a furnished balcony with Aegean Sea views. It has a mini fridge and a flat-screen, satellite TV. Featuring a rain shower, private bathroom also comes with a hairdryer. Free WiFi is provided. Offering a private pool, this air-conditioned and tastefully decorated, spacious villa opens to a furnished balcony with Aegean Sea views. It has a mini fridge and a flat-screen, satellite TV. 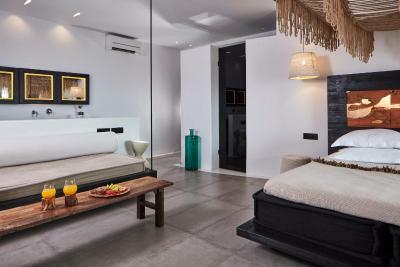 Featuring a rain shower, private bathroom also comes with a hairdryer. Free WiFi is provided. 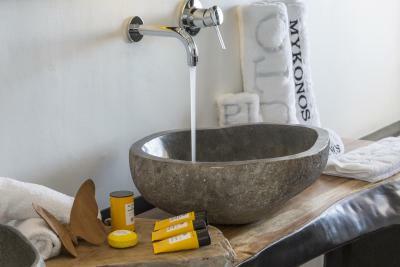 House Rules Myconian Utopia Relais & Chateaux takes special requests – add in the next step! 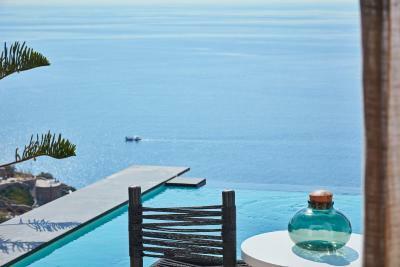 Myconian Utopia Relais &amp; Chateaux accepts these cards and reserves the right to temporarily hold an amount prior to arrival. 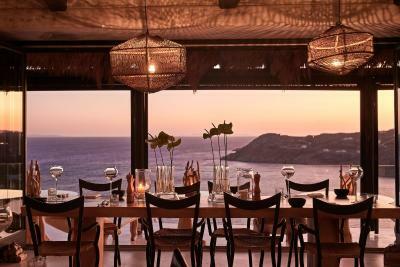 Myconian Utopia Relais & Chateaux accepts these cards and reserves the right to temporarily hold an amount prior to arrival. This was without doubt one of the highlights of our Greek islands holidays. 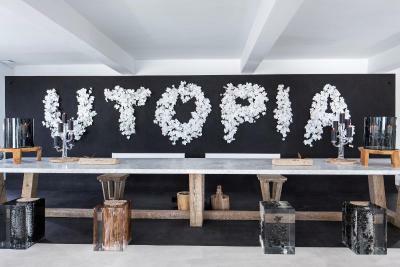 This hotel and its staff truly pay honor to its name: Utopia. Our stay was indeed out of this world, a true utopia. 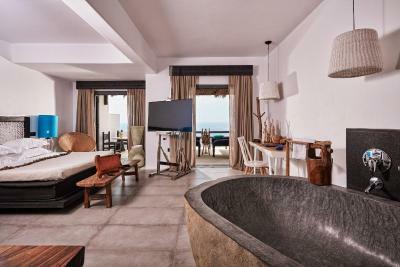 Starting with the amazing surprise with which the management greeted us: an upgrade to a wonderful suite with a private pool. This was the end of our trip and we had already explored the island and on top of that it was windy, so we decided to make the most of such a treat and spent most of our time enjoying the suite, the free-from-wind patio & pool as well as the rest of its amazing facilities and taking in the extraordinary views over Elia beach while sipping into delicious white wine. A unique experience and a great way to relax before going back home. Nothing; everything was like a dream. 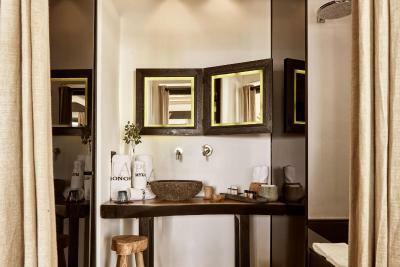 - Very small room, which did not correspond to the one booked (35 m2 on website and finally got a smaller one, with bathroom and toilets directly in the room, no intimacy at all, just a transparent curtain as separation). The only response of the manager was that the size is more or less the same. - Also, only one chair in the room, no table if you want to eat in your room. Again, when I asked for a second chair and small table, the answer was to use the terrasse - which was obviously impossible given the wind (the Meltem is very strong in August) or to bring the outside one inside - of course by myself with no support from the service. - They favored the decoration which is actually not functional at all: nothing to store shoes, clothes except an opened wardrobe with hangers - you have the impression to live with your luggages! Also, same problem for towels on the bathroom side: nothing to hang towels. 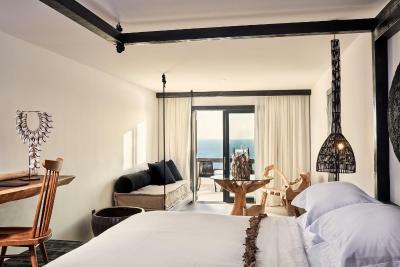 - Avoid the small room at the top of the hotel (numbered 800) they are all aligned, very noisy, no soundproofing at all, impression to live with your neighbors. From the room, you can hear everything from the others room or common facilities, in particular the cleaning service starting at 7.30. 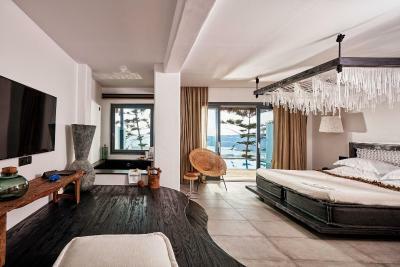 - The ultimate was when a helicopter landed on the roof of the room, which acts as heliport, to leave at 6 am in an incredible noise - Far away from everything - No water in the room and given the price, this should be included. - Very expensive at the restaurant for the basics things such as the Greek dips: at the Royal, for the same price and exactly the same quality/food, the portion are larger. - Pool can’t be used as the water is very cold. - No deck chair at the pool, people leaving their towel in the morning- again, prefer the pool at the Royal. - The view. - The breakfast is fabulous, with very nice personnel. - Amazing contemporary decoration. - The quality of service at the restaurant. - Cleaning twice a day. 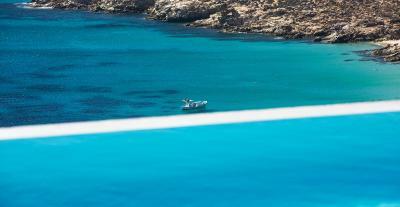 - The free transfer to the town and port/airport, which is actually the minimum given the location. The breakfast was not good at all! Stunning View and Amazing Staff. The only downside: the pool was not heated. One of the best resorts I've ever been too, and I've travelled a lot. Totally mesmerising. Incredible staff. Magic views. Amazing food.